The economy is in trouble, and Donald Trump is the only one who can fix it. So declared voters in Tuesday's historic election, which saw the billionaire businessman defy the polls to claim the presidency. The economy: Nearly two-thirds of voters said the nation's economic condition is poor or not so good, according to CNN exit polls. And these folks voted for Trump by a 2-to-1 margin. Some 36% think the economy is in excellent or good shape. Hillary Clinton secured 77% of voters who feel this way, compared to 18% for Trump. 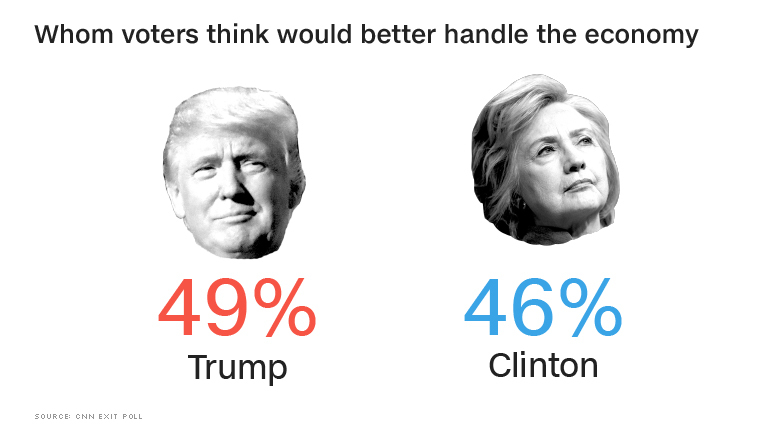 When it comes to who would handle the economy better, voters flocked to Trump. Some 49% of those who went to the polls said he'd do a better job, while 46% selected Clinton. 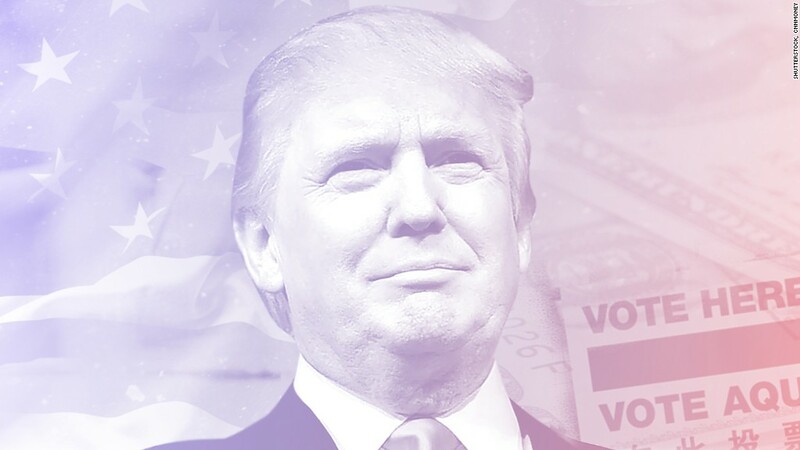 Trade: America's trade deals were a major issue throughout the campaign, with Trump hammering home that the U.S. has entered into bad agreements that have cost Americans their jobs. And more of the electorate believed him than didn't. Some 42% said trade hurts employment, compared to 38% who said it creates more jobs. Trump secured the support of those who feel negatively about trade by a 65% to 31% divide. Trade was an important issue for voters in the key Rust Belt states, where Trump campaigned heavily and promised to bring jobs back. Related: Trump check: Has NAFTA 'destroyed our country'? Half of Michigan's electorate feel trade takes away jobs, and these folks supported Trump by a 59% to 36% split. The 31% who think trade creates jobs strongly backed Clinton. In Ohio, 48% of voters say trade hurts workers, and they lined up for Trump by a more than 2-to-1 margin. The 45% who think it creates jobs or has no effect lined up behind Clinton. And in Pennsylvania, 53% of the electorate agree that trade is bad for jobs. They heavily favored Trump. Among the 34% who feel trade is a job creator, the reverse was true. Trump won Pennsylvania and Ohio and is leading in Michigan. When it comes to their own family's financial situation, only 27% said they are in worse shape compared to four years ago. Not surprisingly, these voters cast their ballots for Trump by a 78% to 19% split. About four in 10 said their family's finances are in about the same shape. They split evenly between Trump and Clinton. Of the 31% who said their situation is better, 72% voted for Clinton and 24% for Trump. Obamacare: Nearly half of voters said Obamacare went too far, and these folks flocked to Trump by an 83% to 13% split. Of those who feel it was about right or didn't go far enough, Clinton was the heavy favorite. Income: Trump's strongest supporters were among those earning $50,000 to $100,000. Half cast ballots for him, compared to 46% who backed Clinton. Higher income Americans generally favored Trump. Those who earn $100,000 or more were slightly more likely to vote for the Republican candidate, whose tax plan would lower their levies. Voters earning less than $50,000 threw their support to Clinton. Not all of the polling data, however, showed Trump on top when it comes to economic issues. The economy was by far the most important issue for voters when compared to foreign policy, immigration and terrorism. But those who picked the economy as Issue #1 favored Clinton by a 52% to 42% margin.